In our attempt to relieve our pain, the U.S. is leading the world in popping prescription painkillers, and more and more people are dying. According to the National Institute on Drug Abuse, the U.S. accounts for five percent of the world's population, yet we consume seventy-five percent of the world's prescription drugs. Death rates from prescription opioid pain reliever overdoses in this country quadrupled from 1999 to 2010, the CDC reports. Dr. Chinazo Cunningham, professor and attending physician of family and social medicine at Albert Einstein College of Medicine and Montefiore Medical Center in New York, spoke with CBS News about America's rapidly growing prescription opioid abuse epidemic. "In the last about ten years, there's been a huge increase in the amount of opioid use and opioid abuse and dependence. In addition, there's been a really stark increase in overdose deaths related to opioid abuse," she says. Opioid pain relievers were involved in 14,800 overdose deaths in 2008, more than cocaine and heroin combined, according to the CDC. Children often end up in the emergency room after accidentally ingesting their parent's prescriptions. Cunningham believes the prescription opioid epidemic was born from the way we view and treat pain in the U.S. She explains that 20 years ago there was a movement to make sure that pain was adequately treated. "Pain became the fifth vital sign," she says. As it became routine to rank pain on a sliding scale, doctors felt compelled to offer stronger drugs to treat it, and wrote more and more prescriptions. The CDC reports that enough prescription painkillers were prescribed in 2010 to medicate every American adult around-the-clock for one month. Dr. Drew says "addiction is not a moral failing"
"Now, we find ourselves to the point where it's almost like no one's allowed to have pain, because they're given medication very quickly including opiates to treat the pain," Cunningham explains. While powerful opioid painkillers like Vicodin, Percocet and OxyContin can be a godsend for people suffering from acute pain, they are also susceptible to abuse. Long-term use builds up resistance, leading some users to seek multiple prescriptions and ever higher doses. Dependence on prescription painkillers has also become a gateway to heroin addiction. According to the National Institute on Drug Abuse, 1 in 15 people who take a prescription painkiller for non-medical reasons will try heroin within the next 10 years. While Cunningham says the Albert Einstein College of Medicine has a structured curriculum around how to treat addiction, that's not the case at all medical schools throughout the country. Cunningham says most doctors receive little education about addiction and are often poorly equipped to treat it. "So, it's no surprise that doctors then don't treat addiction because they don't know how to do it, they don't have the skills, they don't have the knowledge, and they don't have the confidence," she says. Cunningham and her colleagues note that multiple studies have found discrimination on the part of doctors in prescribing and monitoring opioids. Prescription painkiller abuse often involves white, middle-aged people not thought to fit the profile of drug addicts. "When the face of addiction doesn't match what people have historically had in their mind, they may have different treatment practices," Cunningham observes. Statistics from the CDC show the highest rates of overdose deaths from prescription opioid painkillers come from whites between the age of 45 and 54. "We think it's really important to have very standardized practices: to get urine toxicologies on everybody, to have frequent visits with everybody, to recommend psychosocial support for everybody who needs it regardless of gender, age, race, and ethnicity," Cunningham explains. If you are taking part in this #14Days on the Wagon challenge and feel you may have a prescription pill problem, talk with your doctor. Cunningham suggests you may benefit from taking a harm reduction strategy: reducing the number and frequency of pills you take per day. If you missed day one of #14Days, it's not too late to take some healthy first steps. On day two of the series, we found out how tapping can help alleviate stress. On day three, Dr. Drew explained that "addiction is not a moral failing. "On day four, we explored the debate over moderation versus abstinence. 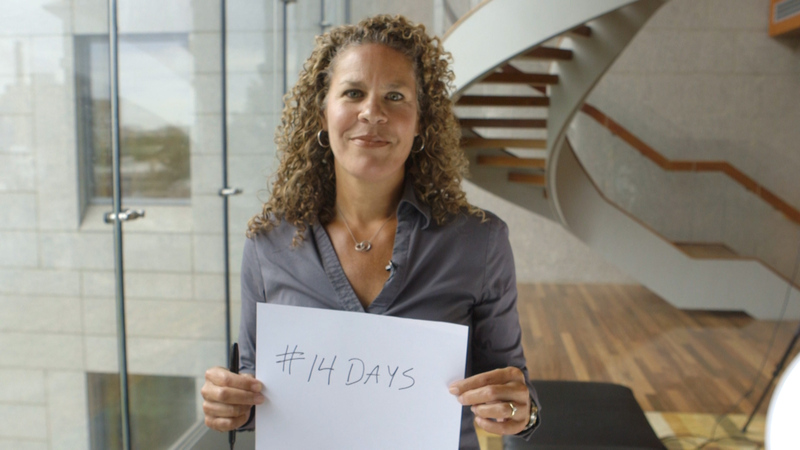 Use the hashtag #14Days to tell us how the challenge is going for you.